Dermatoglyphics is the study of dermal ridge patterns of fingertips, palms, and soles of the feet which was first proposed by Cummins and Midlo in 1926. These dermal ridge patterns are determined genetically, by the interaction of several genes, and thus, they are a characteristic feature of a person which differs from one person to another. Galton in his studies classified different fingerprint patterns as loops, whorls, and arches. In recent years, many studies have been conducted on dermatoglyphics to assess intragroup diversity and differentiation of population. Several researchers worldwide have explicated dermatoglyphic profiles, employing them to gather important population- and genetic-related information., Not only for population studies, but recent studies are also focusing on establishing a relationship between fingerprint pattern and learning, health, fitness, attitude, blood group, etc. It is because the subject is developing its importance in everyday life and researchers are keen to unveil various unknown aspects of dermatoglyphics in biology, anthropology, genetics, general health, and medicine. Scientists have discovered that fingerprints and innate intelligence are related. Kumari et al., in their study opine that each finger relates to one brain lobe plus a specific type of intelligence and each fingerprint pattern relates to a specific type of learning: Whorl-Cognitive learning; Ulnar Loop-Affective Learning; Radial Loop-Critical Thinking; Tented Arch-Enthusiastic Learning; and Arch–Reflective Learning. During our literature review, we found that studies which prove this hypothesis are very less. As per our knowledge, there are no studies which explore the relationship of various patterns of thumbprint and study pattern of students. Hence, the present study was conducted to assess the relationship of thumbprint, learning methodologies, and academic performance of undergraduate medical students of Malaysia and Sri Lanka. A total of 143 undergraduate medical students aged between 17 and 19 years participated in the study. Among them, 54 were males and 89 were females and their participation was purely on voluntary basis. Most students belonged to three different Malaysian ethnic races, i.e., Malays, Chinese, and Indians (Malaysian Indians) and a few others from Sri Lanka. Ethical clearance was obtained before the study (Reg: IEC 802/2015) and respondents gave their informed consent before taking part in this study. Questionnaires, stamp pad, manila card, tissues, ink remover. Questionnaires were used in the present study which was validated by academic faculty. The questionnaire included student's demographic data, questions on various learning methodologies employed by the students, their study patterns and marks obtained by the students during the academic year. The marks obtained by the students were grouped into three categories: above average marks (<75%), average marks (50%–75%), and pass marks (<49%). At the end of the questionnaire, the right thumb impression from the students was taken using a stamp pad. The students were asked to place their right thumb on the stamp pad and then asked to place it on the paper; roll their thumb from one side to another to get a complete impression of the thumb. Care was taken to ensure, we obtained a proper thumb impression without any overlap. The responses given by the students to the questions were then analyzed. Dermatoglyphic patterns recorded were studied with the help of a magnifying lens. All the data obtained were first segregated according to gender, and then according to race. The fingerprints were classified and grouped into four basic patterns: whorl, arch, radial loop, and ulnar loop. The patterns were then correlated to the learning methods and academic performance of students. Results obtained were expressed in percentage. Appropriate graphs were used to present the results. The fingerprints obtained from the students were grouped into four dermatoglyphic patterns: Whorl, arch, radial loop, and ulnar loop. The most common fingerprint pattern found among the students was the whorl pattern (n = 55), followed by radial loop (n = 38), arch (n = 30), and ulnar loop (n = 20). When we correlated the fingerprint pattern with the race of the students, we found that Malays, Malaysian Indians, and Chinese mostly had whorl pattern, while among the Sri Lankans, the most common pattern was radial loop [Graph 1]. Questionnaire analysis on study pattern and learning methods revealed that most of the students take notes in class [Graph 2] and many students with ulnar loop brought reference books to class while the percentage was less among the students with other patterns [Graph 3]. It was also seen that students with ulnar loop revised the previous chapters before coming to class [Graph 4]. Many students surfed the Internet for learning process and used social media while studying. 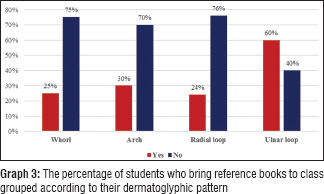 The percentage was high among students with whorl pattern (75%) followed by students with arch pattern (73%), radial loop (66%), and ulnar loop (55%). When we asked, the students regarding their preferred method of learning, they opined that lecturing was useful for them. 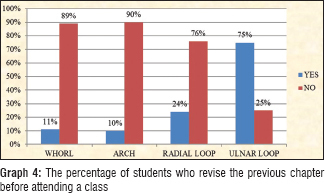 It was also noted that students with radial loop, whorl, and arch pattern also preferred the self-directed method of learning while students with ulnar loop preferred problem-based learning [Graph 5]. When we compared the fingerprint pattern with the academic performance of students, we found that high percentage of students with ulnar loop scored distinction while students with other patterns mostly scored pass marks [Graph 6]. Studies on dermatoglyphic patterns are an increasing trend in recent years. In this study, we have tried to establish a relation between dermatoglyphic pattern, academic performance, and learning methodologies of medical students. Analysis of the fingerprint patterns from this study showed that whorl pattern was the most commonly occurring pattern followed by loop and arch. This is in consonance with the previous studies., However, there are a few studies which have shown that loop pattern is the most common fingerprint pattern., These contradicting views suggest that dermatoglyphic pattern varies depending on the geographical distribution of the population. Academic performance of a student is a result of the student's learning ability. It also indicates the level of students reasoning and understanding capabilities. The cerebral cortex, fingerprints, and palm prints develop at the same period from embryonic ectoderm. Epidermal ridge patterns begin to appear on the embryo during the 6th to 19th weeks of intrauterine life and remain unchanged during the lifetime of an individual. Hence, although not proved, it is stated that learning capacity, cognitive ability, and dermatoglyphic patterns are related to one another. 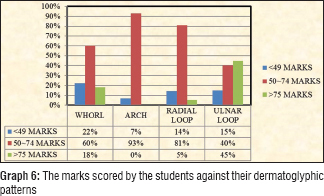 We found in our study that most of the students with whorls were either in low or average scoring groups while students with ulnar loop pattern scored higher marks compared to others. This fact was also found in previous studies which reported that loop pattern on any finger relates significantly with better academic performances of students and better IQ., Adenowo and Dareb in their study on fingerprint pattern of medical students have also found that percentage distributions of ulnar loops were highest among the good category of students and percentage distributions of arch patterns were relatively higher among the weak categories of students. We also observed this aspect that distribution of whorl pattern was higher among the students who scored less. It can be noted that students with ulnar loop scored better in examinations because the majority of these students employed active learning strategies such as bringing reference book to class, revising previously taught chapter before attending a class, taking notes in class, and surfing the internet for learning. This shows that this group of students scores well not only because of the fingerprint pattern but also because of their good learning methodologies. Another interesting observation we found in our study was that most students preferred lecture method of teaching. 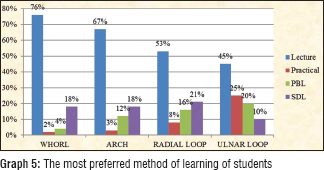 Along with that students with ulnar loop also preferred problem-based learning and students with radial loop preferred self-directed learning methods. This finding supports the view of Kumari et al., who hypothesized that students with loop pattern prefer critical and effective learning, while students with whorl pattern prefer cognitive learning. This study revealed that students with ulnar loop scored better academically and practiced active learning methodologies compared to students with other fingerprint patterns. This shows that dermatoglyphics is related to the learning capacity of an individual. More studies in this regard should be embarked on, to establish the exact association between these parameters. Cummins H, Midlo C. Finger Prints, Palms and Soles: An Introduction to Dermatoglyphic. New York: Dover Publication; 1961. Galton F. Finger Prints. London: McMillan and Co.; 1892. 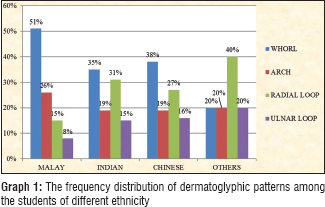 Namouchi I. Anthropological significance of dermatoglyphic trait variation: An intra-Tunisian population analysis. Int J Mod Anthrop 2011;4:12-27. Zhang HG, Chen YF, Ding M, Jin L, Case DT, Jiao YP, et al. Dermatoglyphics from all Chinese ethnic groups reveal geographic patterning. PLoS One 2010;5:e8783. Kumari L, Babu V, Kumar V. Dermatoglyphics and Its relation to intelligence levels of young students. IOSR J Dent Med Sci 2014;13:1-3. Oladipo GS, Sapira MK, Ekeke ON, Oyakhire M, Chinwo E, Apiafa B, et al. Dermatoglyphics of prostate cancer patients. Curr Res J Biol Sci 2009;1:131-4. Nanakorn S, Honark N, Ungpansattawong S, Chaisiwamongkol W, Maneesriwongul W, Suwanwerakamtorn R, et al. Fingerprint pattern and multiple intelligence: A preliminary study. KKU Sci J 2011;39:105-12. Kanchan T, Saurabh C. Distribution of fingerprint patterns among medical students. JIAFM 2006;28:65-8. Nayak SB, Kaur PJ, Teow XM, Tan JM, Aithal AP. A study on the dermatoglyphic pattern of the right thumb among Malaysian medical students. J Punjab Acad Forensic Med Toxicol 2016;16:26-30. Hirsch W, Schweichel JU. Morphological evidence concerning the problem of skin ridge formation. J Ment Defic Res 1973;17:58-72. Seidenberg-Kajabova H, Pospisilova V, Vranakova V, Varga I. An original histological method for studying the volar skin of the fetal hands and feet. Biomed Pap Med Fac Univ Palacky Olomouc Czech Repub 2010;154:211-8. Offei EB, Abledu JK, Osabutey CK, Kesse DK. Relationship between palmar dermatoglyphic pattern and academic performance of students in a Ghanaian secondary school. J Med Biomed Sci 2014;3:24-31. Najafi M. Association between finger patterns of digit II and intelligence quotient level in adolescents. Iran J Pediatr 2009;19:277-84. Adenowoa TK, Dareb BJ. Digital and palmer dermatoglyphic; A bio-indicator for intelligence quotient. J Basic Appl Res 2016;2:313-9.